Geniune Chevrolet 2012 Camaro dealer sales brochure. This is an item most people forget to ask for when purchasing their car. It's a must have article to have to complete your documentation with your car. Check my other items for sale many Chevrolet brochures to be listed. Free shipping within the United States. Additional $7.50 USD to ship outside of US. It has 19 full color pages. It shows all the facts and options for it. Here we have a1973 Chevrolet Camaro sales brochure. This is an ORIGINAL brochure, NOT a reprint. RALLY SPORT. 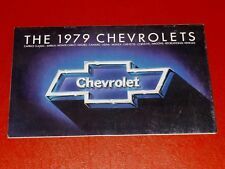 This brochure covers the following models Features of this brochure Chevrolet's ref # January 1973 2223 Rev. For sale is an awesome sales brochure for the new 2019 Camaro! The beautiful brochure has amazing photos of all the trims and information on the car’s options and capabilities! 2019 CHEVROLET CAMARO BROCHURE Ss. Condition is New from dealer. So if you don't see it, JUST ASK! Paul Politis. SERVING the COLLECTOR CAR HOBBY and MOTORING PUBLIC SINCE 1974. FULL COLOR 2018 MODEL YEAR CHEVROLET CAMARO DEALER SHOWROOM SALES BROCHURE INCLUDES We look forward to serving you soon. Sold as is. It's all here with standard and optional engines, transmissions, and trim levels. 2012 Chevrolet Camaro literature lot. They are in excellent condition. 2019 Camaro Brochure Chevrolet Camaro Mint! USA specs. Want to check out the '19 Camaro with a REAL brochure and not get hassled at the dealer?. Here we have a1989 Chevrolet Camaro sales brochure. This is an ORIGINAL brochure, NOT a reprint. This brochure covers the following models Features of this brochure Highlights many of the great Chevrolet features found in these vehicles. Geniune Chevrolet 2015 Camaro dealer sales brochure. This is an item most people forget to ask for when purchasing their car. It's a must have article to have to complete your documentation with your car. Check my other items for sale many Chevrolet brochures to be listed. Free shipping within the United States. Additional $7.50 USD to ship outside of US. Geniune Chevrolet 2013 Camaro dealer sales brochure. This is an item most people forget to ask for when purchasing their car. It's a must have article to have to complete your documentation with your car. Check my other items for sale many Chevrolet brochures to be listed. Free shipping within the United States. Additional $7.50 USD to ship outside of US. Get this collectible brochure while you can. 2018 is a great looking Camaro! Cool cars and motorcycles. LS, RS, SS Coupe models. Sales Brochure. 20-page brochure on the models. 2011 Chevrolet Camaro. Your Source. On Your Camaro with Special Options and Custom Features No Matter What Level of Personalizing You Choose. 1967 Camaro Power Team Chart. SS 350 Camaro Sport Coupe. Camaro Sport Coupe. Rally Sport Camaro Convertible. Geniune Chevrolet 2014 Camaro dealer sales brochure. This is an item most people forget to ask for when purchasing their car. It's a must have article to have to complete your documentation with your car. 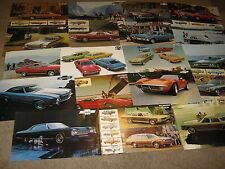 Check my other items for sale many Chevrolet brochures to be listed. Free shipping within the United States. Additional $7.50 USD to ship outside of US. Camaro----Camaro RS----Camaro Z28 in coupe and convertible. Here we have a1996 Chevrolet Camaro sales brochure. This is an ORIGINAL brochure, NOT a reprint. It is in VERY GOOD condition. Features of each model are highlighted along with OPTIONS and SPECIFICATIONS. Original 1974 Chevrolet Dealer Sales Brochure. This Brochure highlights the many Options that were available for the Full Line of Chevy Cars. It is in good condition with minor wear. 1968 Chevrolet Canadian Sales Brochure. The brochure has pictures/illustrations of the various models and information on features. Chevelle 300 Deluxe & 300. Details: W 8.25 xH 11 xD 0.1. Original 1982 Chevy Camaro Custom Convertible Conversion by Auto Dyne Sales Leaflet. It is in very good condition and will display well. Caprice---Lumina sd/cp/van---Corsica---Beretta---Cavalier---Camaro---Celebrity Wagon---Corvette (minimal 2 page). Here we have a1990 Chevrolet Full Line Car Deluxe sales brochure. This is an original brochure NOT a reprint. This is an ORIGINAL brochure NOT a reprint. Features of this brochure 1982 Chevrolet Camaro/Celebrity factory color selection folder. Exterior paint chip colors. 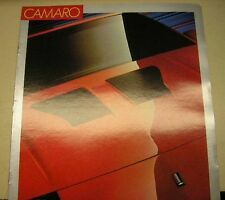 Original 1980 Chevrolet Camaro Sales Brochure. Very good condition with very little wear or age. Includes Available Options. See pictures for quality and detail of this original sales brochure.